Saturday Oct. 13 was a long day for me. I live on the East Coast of the U.S., but I was in L.A. for the Masters world track cycling championships. My internal clock hadn’t shifted, and since I’m usually awake at 5 a.m. ET, I was up at 2 a.m. PT on the day of the semifinal and finals for my sprint event (women 35 to 44). I was a disappointing fourth earlier in the week in the 500-metre time trial. So the sprint event was my last chance at a dream: a world championship gold medal. When I was younger and lived in Canada, I was a multi-sport athlete. I reached elite levels in golf and badminton, primarily. I won a junior provincial championship in badminton. The year before I moved to the U.S., I made two semifinals in provincial series events, and won all three events at a 30+ masters event (my first triple crown in my badminton career). I moved to Charleston, S.C., where there is no elite badminton. I needed a new sport. I’m terrible at running. I tried spin classes and fell in love. On a whim, I bought a road bike and within a few months I was racing. I didn’t win right away, but when I take on a new activity, I study it incessantly. Soon I was winning local races, then regional races, then my first state championship. The next season I began racing in other states, and eventually all over the U.S., and into Canada. But I reached the limit of my ability in road racing. At best I could win a very rare professional race if the course was perfect and I got lucky because other teams didn’t use the right tactics to isolate me. In other races, I was near the back of the pack. I was always a gifted sprinter, but I struggled making it to the finish sprint. In a 60-minute criterium race (think downtown NASCAR on bikes), I’d be bored for 58 minutes, waiting for the final two minutes before the sprint. 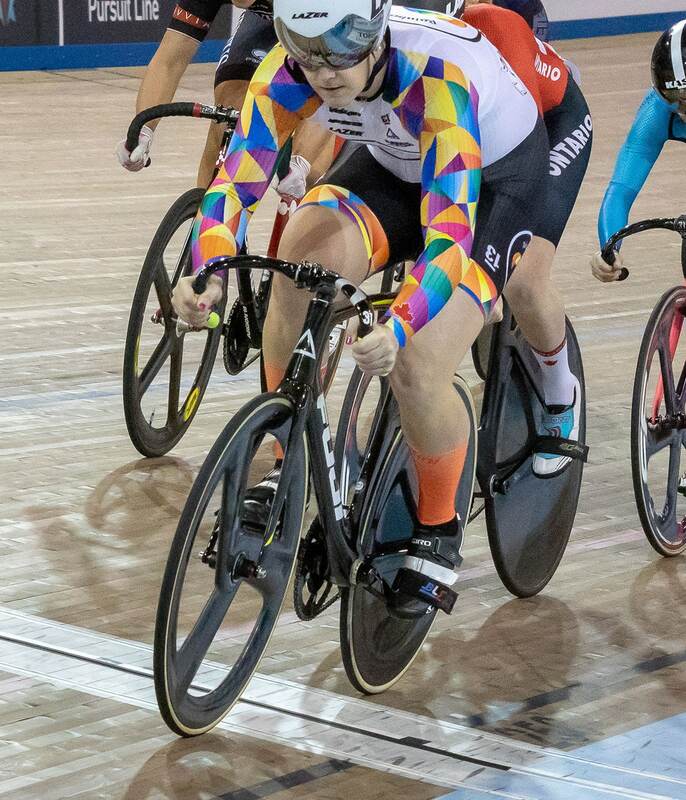 Track cycling had always been alluring to me because the whole race is just that final two minutes. The match sprint event is only 750 metres, and we’re usually going at walking pace for the first 250-metre lap. So in 2017 I jumped in head first and dedicated 15-20 hours of training per week, usually training twice per day. We set our sights on the Masters world championships 15 months later. It’s now 9 a.m. on Saturday, and it’s the semifinal, which is a best two out of three format. I’m racing against an acquaintance. We raced once previously in July in Seattle and I won. She has improved since then. But I still manage to win both races and I advance to the final against the defending age 40-44 world champion. On Friday, I broke the 200 qualifying world record in my age group. My record stood for 10 minutes before being broken again by the final rider, who was last year’s age 35-39 world champion, and this year’s 500 time trial world champion. She beat me in both the 500 and the 200 qualifying races. Then she withdrew from the competition in protest. Protest over what? I am a transgender woman. People are convinced that it’s unfair for me to compete, even though there are very stringent rules that trans women have to satisfy in order to compete. I clearly satisfy those rules. But some still have an irrational fear of trans women. I found it confusing that a competitor claimed I had an unfair advantage, even though she beat me in both race events. But fear is irrational. As the second qualifier, I was promoted to the first seed. I faced the second seed in the final, a Dutch woman who told me earlier in the day that she is happy I’m racing and supports what I’m doing. Rachel McKinnon on dealing with backlash following her historic win. What am I doing? I’m a professor. I teach courses on ethics, including sports ethics, and I’m teaching a course on sport and gender, focusing on the question: Is it fair for trans women to compete in women’s sport? My work answers that question clearly. Yes, it is fair. Sport regulations say that we must compete in the sport of our legally recognized gender. I am female, which is reflected in my birth certificate and all my IDs, both Canadian and American. Also, the International Olympic Committee’s charter has seven fundamental principles of Olympism. The fourth begins, “The practice of sport is a human right.” The IOC charter is about competitive sport. I’m an expert on the ethics, law, and science of trans athletics. Unfortunately, some people think that I use sport as a means to advance the “trans agenda” as some sort of “Trojan horse.” That’s false. I’ve been an athlete my entire life. I broke our front window golfing at age three. I was an athlete before I was a philosopher. I was an elite cyclist before I started working on trans athlete rights. My sport informs my teaching and research: it’s not the other way around. McKinnon on the importance of inclusion. Back to Saturday. I’m avoiding social media. Transphobic bigots are blowing up my Twitter and Instagram over news that I broke a world record as a trans woman (even though it was beaten 10 minutes later by a cis woman). I have PTSD and an anxiety disorder from harassment (both career and sport related). I need to have friends and supporters around me at big competitions or else the anxiety gets to me and my performance suffers. The final will take everything I have to win: my opponent, Carolien van Herrikhuyzen is an extremely experienced and crafty sprinter. She’s far more experienced than I am. Happily, I brought my A game. I had the rides of my life in the final. I won the first one, attacking from behind into the final lap and holding her off across the line (but she was coming!). In the second ride, we had an impressive cat-and-mouse first lap, exchanging the lead multiple times. I knew she liked to go from a long way out, and she went very long: she sprinted from over 400 metre out. We practise this: hold a gap until you enter turn 3 of 4. Be patient. Go all out after turn 2. “Come on,” I said out loud as I came into turn 4. I passed her on the final straight. She held my hand up high our next time through. A world championship gold medal. We did it. But now the hate starts. I’m the first trans woman world champion in a long time, but the first out trans woman in the age of social media. The negative messages outweigh the congratulations perhaps 3,000 to 1. It’s okay. I’m ready. These people don’t know how ready I am to come with facts and good arguments. I do this for a living. It’s always darkest before the dawn. Sport is a human right. I want everyone to feel at home in sport, to compete as you are. Trans women are women. Trans men are men. Let’s be kind to each other. A: Lord of the Rings, The Name of the Rose (by Umberto Eco). A: I am the Thunder. A: “What in the actual f--k?" (maybe you need to censor that). A: I got a D in calculus as an undergrad. A: Someone's pet (especially a dog) dying. A: Write a popular press "life story" book.